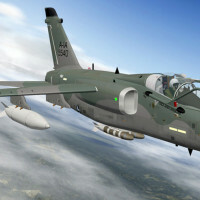 As many FSX/P3D fans know, Dino’s planes are legendary for their uniqueness and quality. My first experience with Dino’s planes was when I was pointed to his awesome T-45C Goshawk for FSX. 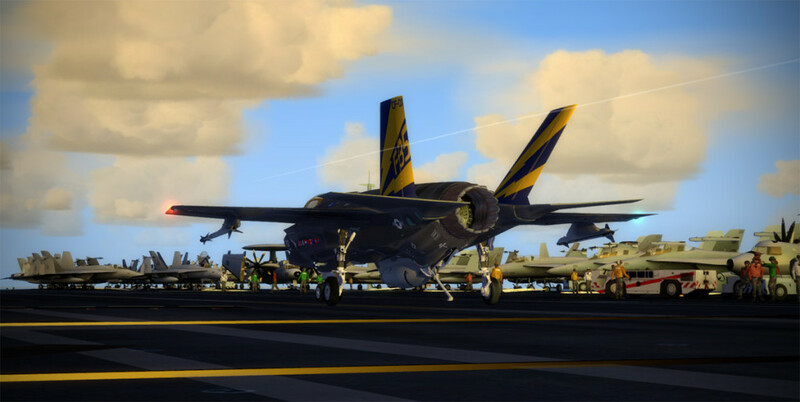 When coupled with Javier Fernandez’s AI Carriers pack, naval flight ops in FSX/P3D really shine. 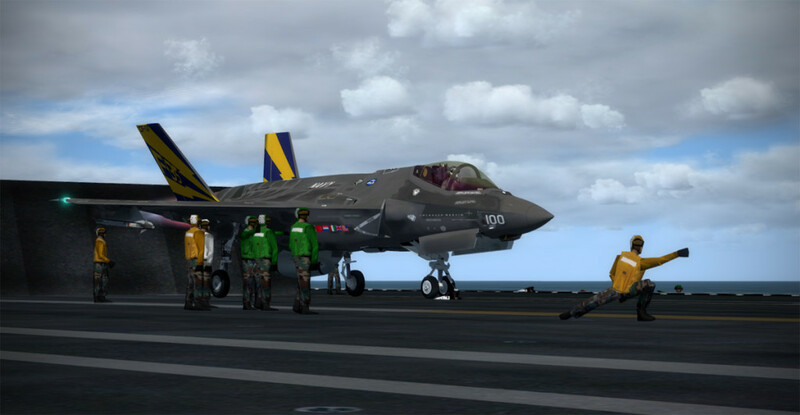 The F-35 was most recently updated in April, 2014, but there are indications on Dino’s website that a further update (ver. 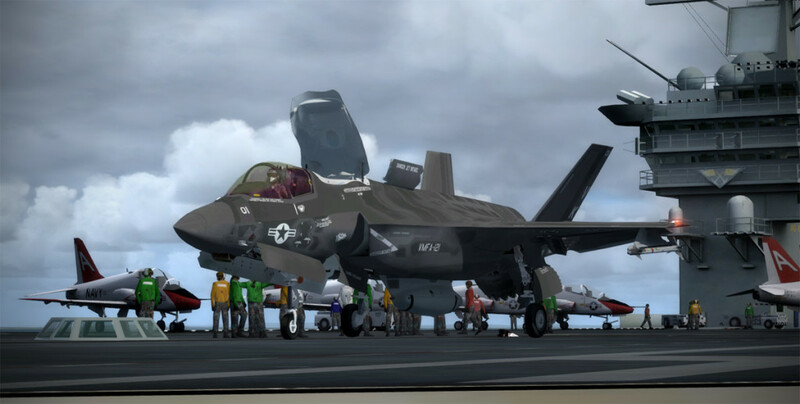 3) to the F-35 might occur after this summer (fingers crossed!). Other aircraft available from Dino include the aforementioned T-45C, Aermacchi MB-326, Grumman F-14D Tomcat, and the Lockheed S-3B Viking. They are all clearly labors of love – but consider donating some cash to Dino via the Paypal button on his homepage. 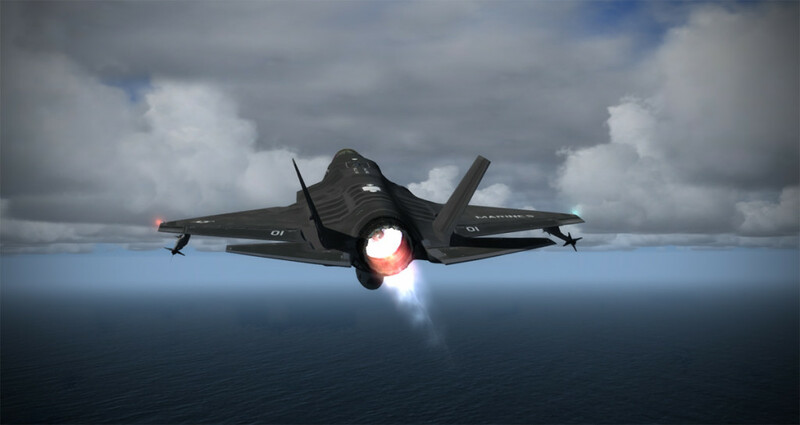 While the Lockheed Martin F-35 II is not my favorite of programs, I can really appreciate the technical accomplishments of it, and as a pilot and simmer, the plane appeals to me. As a taxpayer – maybe not so much. Of course, if we ever get into a shooting war with China or Russia, all of that money will probably be money well spent. 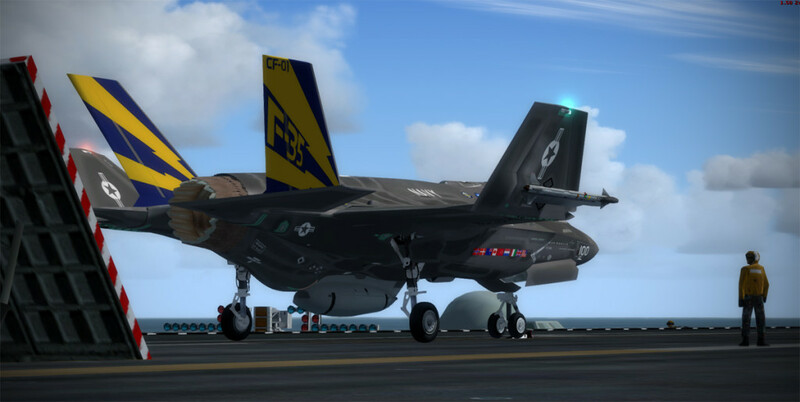 The military-industrial complex seems to have scored a great windfall with the F-35 project though, and it has probably become too big to fail at this point. I try to look at the project through the eyes that I assess simulation software with though, and realize the headlines of failures, slipped project goals, and cost overruns are the negative headlines, and that those sell newspapers. Plenty of good stuff is happening with the project as well. 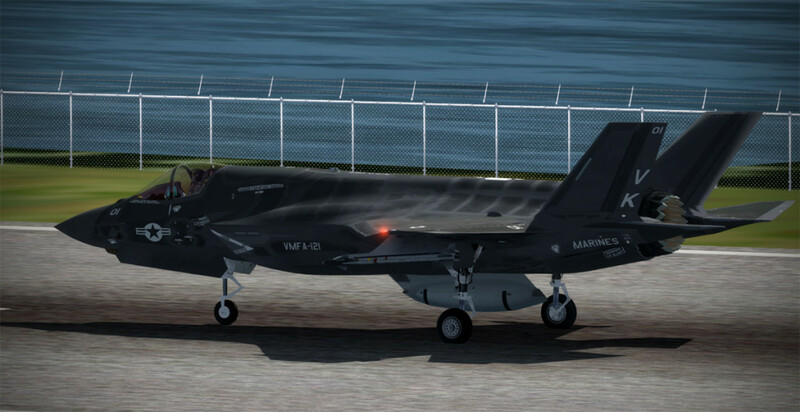 Regardless of my personal opinion of the real world F-35 program, the F-35 as presented by Dino in P3D is simply awesome! 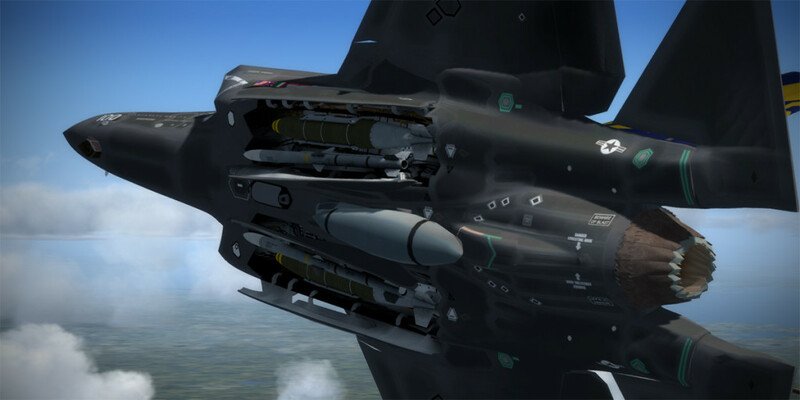 * Tacpack compatible weapons (Cannon, AIM-9X, AIM-120C, GBU-31, GBU-10, GBU-12, JSOW, MK-84, Mk-83, MK82). 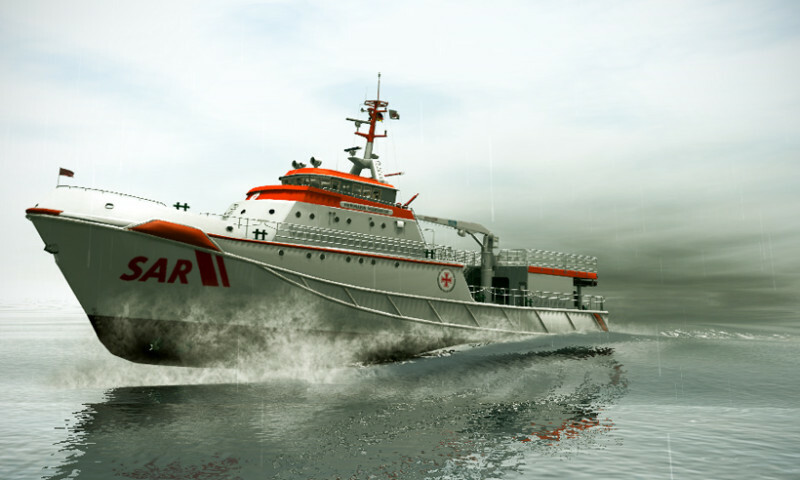 * Tacpack A/A functions: Az/El search and L&S designation, Gun (Gun Director and Funnel modes), Sidewinders & Slammer launch (Visual Boresight and Radar Slaved). * Tacpack A/G functions: TOO mode, AUTO release, MANual release, CCIP mode. 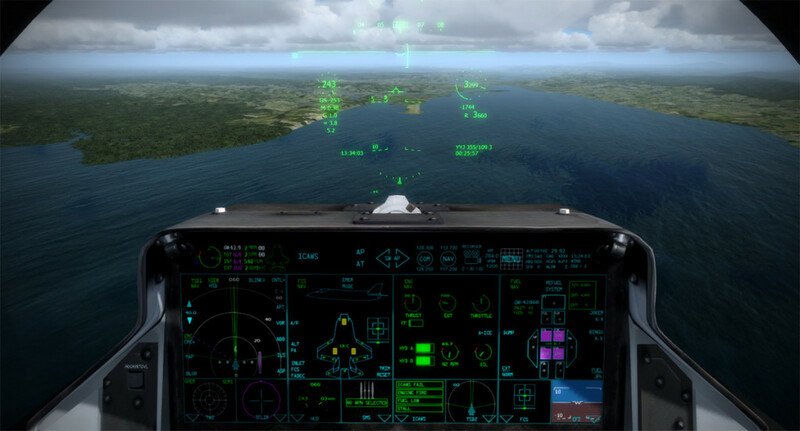 * Tacpack functions: NVGs, Working RWR, Chaffs, Flares, In-flight Refuel. 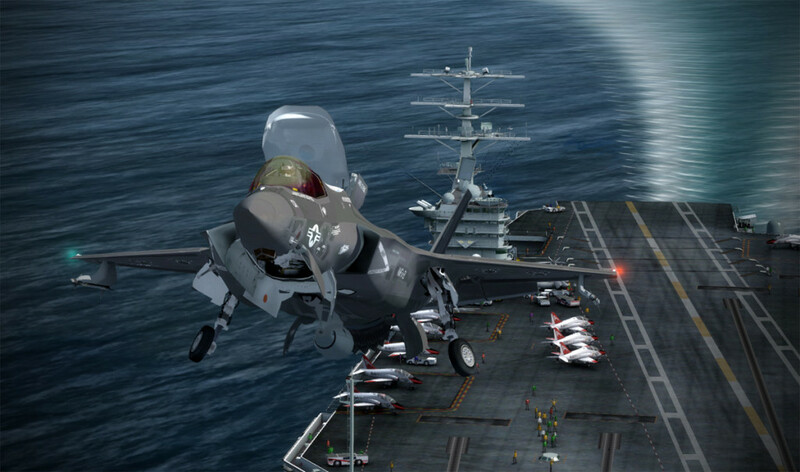 Dino’s package contains the F-35 A (Airforce), B (Marine VTOL), and C (Navy carrier) versions and the external modeling is exquisite. Being a naval aviation fan, I really dig the C variant, but for pure fun and interesting flight dynamics, the VTOL B variant is really cool. 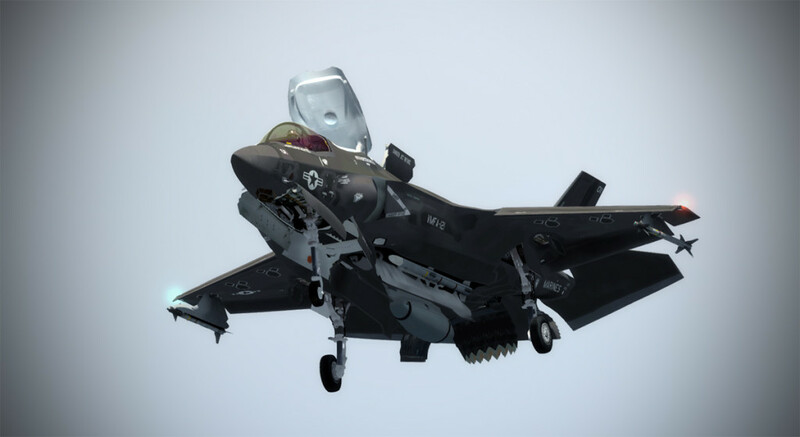 The whole lift fan ducting and swiveling engine nozzle looks like an engineering and maintenance nightmare, but I’m sure those brilliant engineers at Lockheed Martin have it all figured out just fine (just don’t ask them to design a tailhook apparently). The C model, of course, features a tailhook and folding wings. 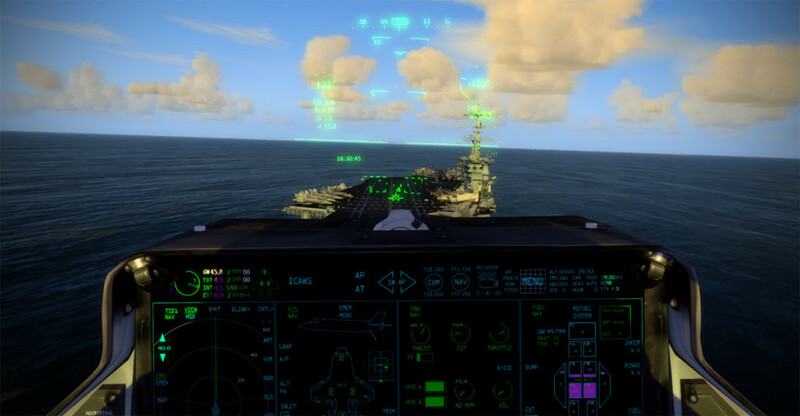 The Marine VTOL version has a button in the cockpit to enable vectoring of the nozzles but all of the control is done through flight computers and whiz-bangery. Short takeoff and landing modes are enabled for higher weights. 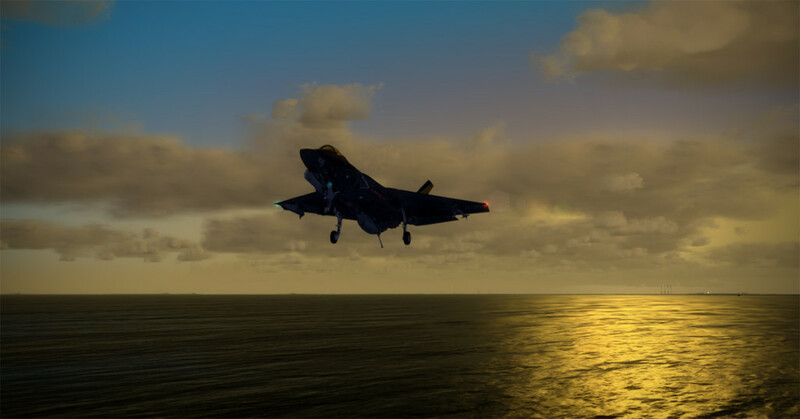 Dumping fuel to a lower weight is required before vertical takeoff and landing modes can be enabled, so planning your landing weight is important. Fortunately, fuel dump occurs very rapidly (pay attention or you might dump all of it!). Dino’s cockpit is stunning and should probably be payware given its functionality and features. You can move the individual display partitions of the Panoramic Multifunction Display to various areas, enlarge them, combine screens, and change display features at will. 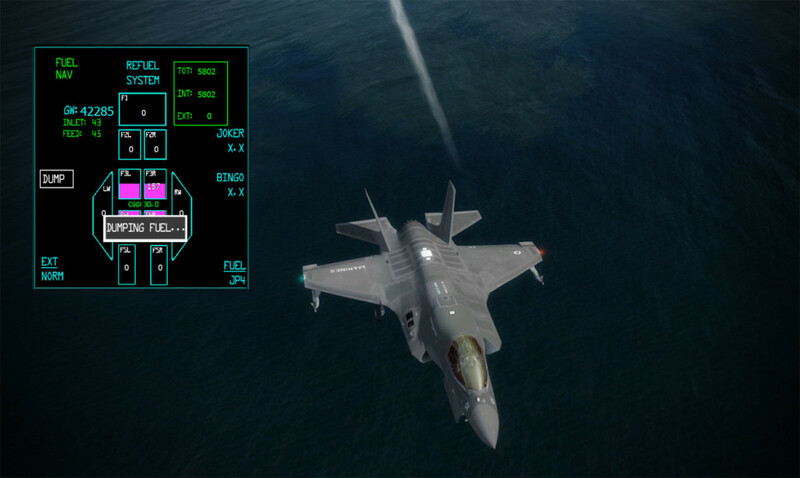 The Tactical Situation Display is really useful to see all of the AI traffic surrounding your aircraft – complete with altitudes and destinations. Helmet Mounted Display and 2D panels are offered, which gives nice flexibility for whatever your system can handle (multiple monitors for instance). The Panoramic Multifunction Display can be touched using the mouse cursor to select different items. On the “B” model the screen inhibits the selection of VTOL if your weight is not commensurate with the mode (HOVER will be in red). It would be very interesting to see how all the weapons and sensors work using the touchscreens, but that will have to wait until I get TacPack running. 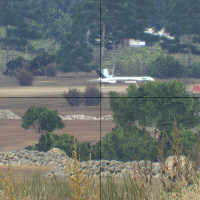 With regards to flight modeling – Dino indicates that the realism is a best guess based on publicly available data and pilot reports. 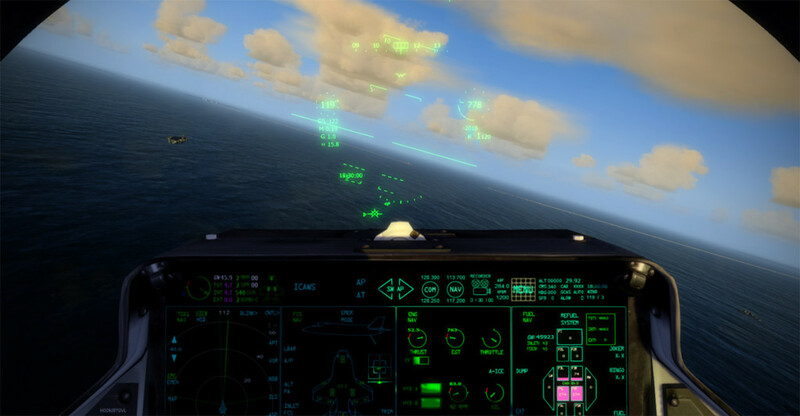 The fly-by-wire system requires almost no trimming, and the STO/VL-mode is implemented in a manner similar to the real aircraft. Upon selecting STOL (70-200 knots) the lift fan doors open and the engine nozzle rotates down to 30-60°. In the STOL mode the airplane can be pitched and rolled within limitations (30° bank limit). 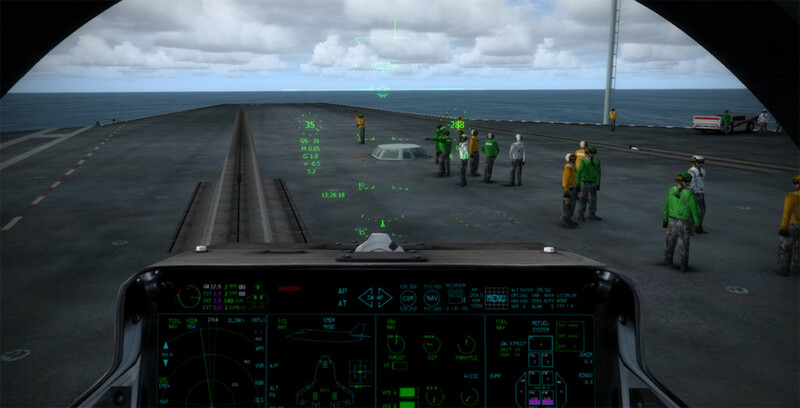 Pressing the HOVER mode on the PMD initiates the VTOL mode (at low enough weights) and the nozzle drops to 75-100°. The plane slows (DECEL) to zero groundspeed and the throttle enters an auto-mode to maintain altitude. Aircraft positioning is maintained with auto-wind compensation. 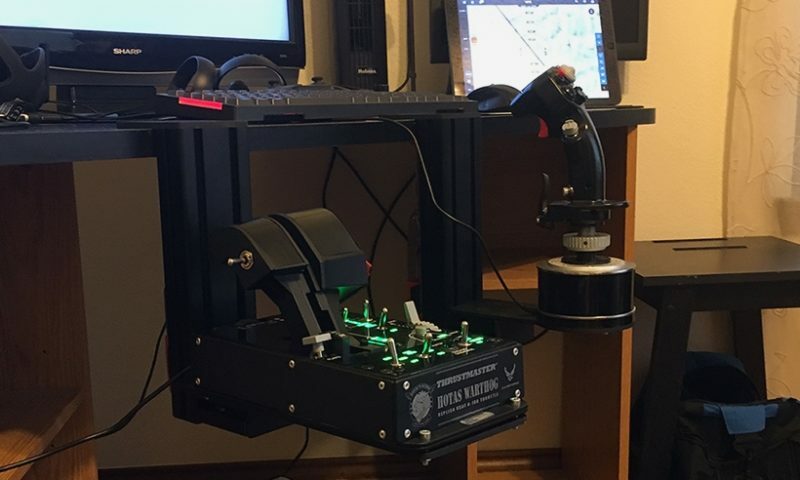 Once the aircraft is in a stable hover, roll inputs are used to slide the airplane left and right, rudder inputs rotate the nose left and right, and the left/right aileron trim buttons control the forward and aft speed setting. Hover mode is a bit awkward for those of us that are used to flying helicopters because your mind automatically transitions into helicopter flight dynamics logic when you are in a hover. 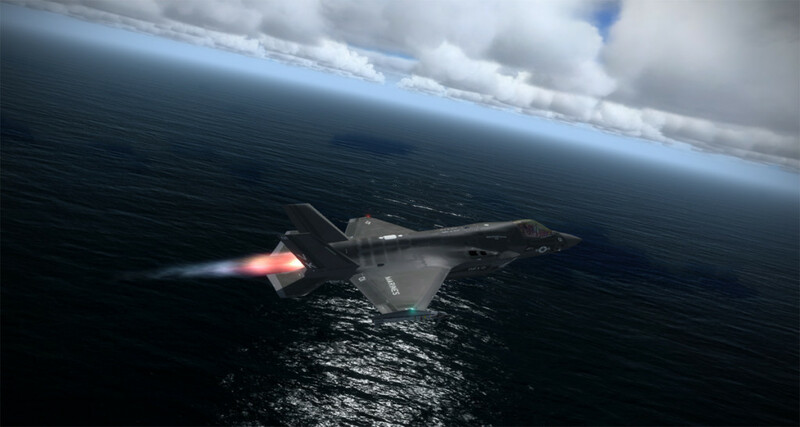 The tendency is to want to push forward on the control stick to tilt the nose down in order to move forward – all this does in the F-35B though is lower your altitude. 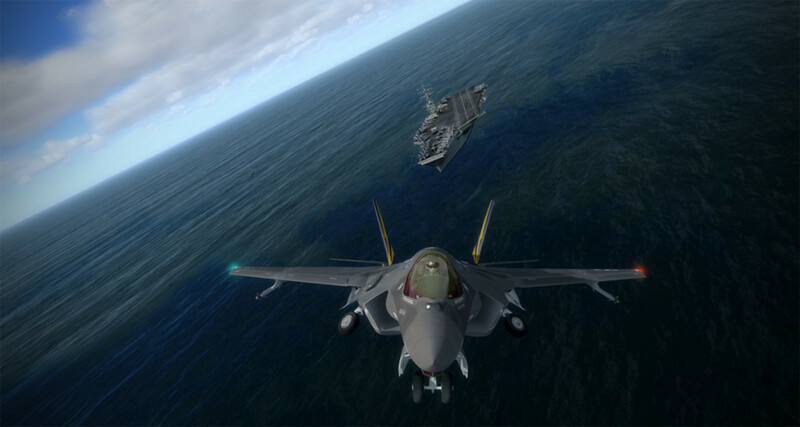 The fore and aft motion of the control stick in the F-35B simply controls altitude. To move forward/aft, multiple presses of the aileron trim button are used. 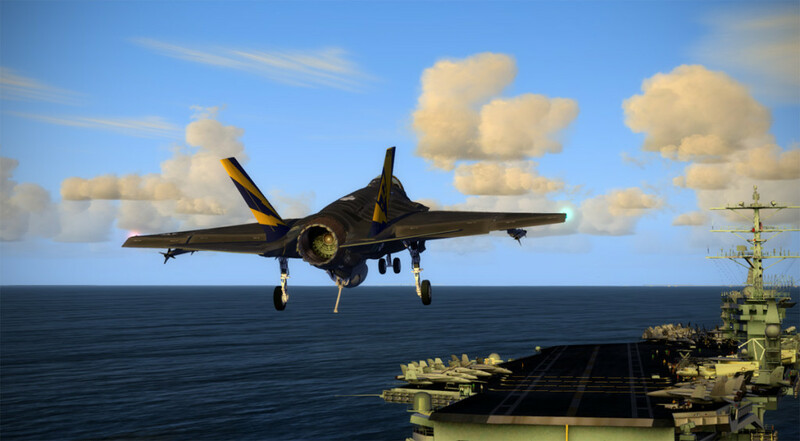 Thus, when you pull abeam a moving carrier, your airspeed will initially drop to zero upon entering VTOL mode, so you need to thumb the aileron trim button several times to set a forward speed of 25 knots or so to keep pace with the carrier. 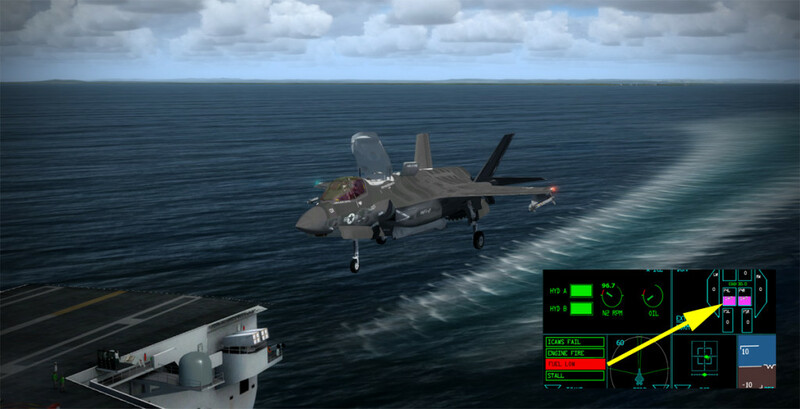 The fly-by-wire system will maintain the inputs you command, so flying the F-35B is very easy once you get a handle on the inputs. The throttle has no function in the hover mode – again, somewhat at odds with how you’d fly a helicopter. 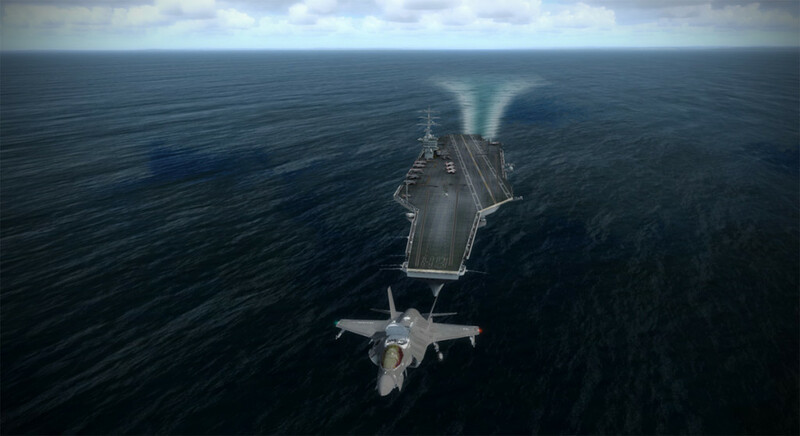 While I was using Javier’s excellent carriers – I’m anxiously awaiting Deltasim Studios USS Essex for F-35B operations. 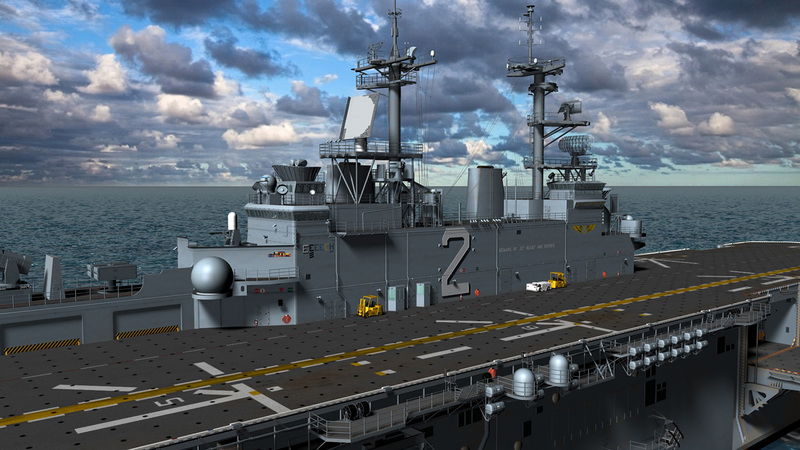 Work-in-progress screen of Deltasim Studio’s LHD-2. 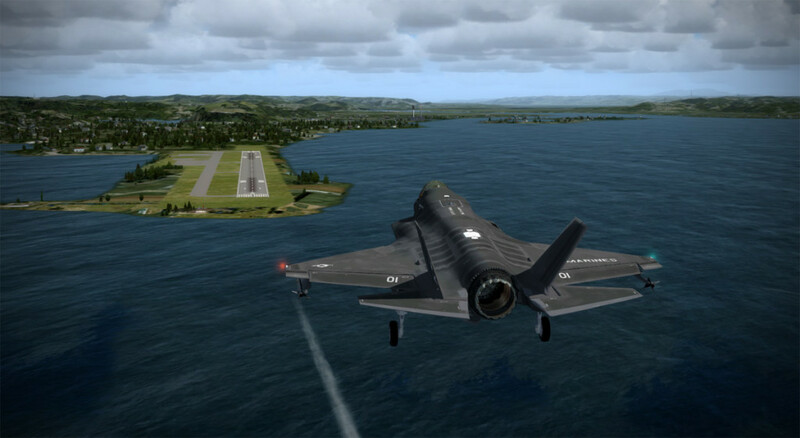 The F-35C model is a ton of fun to fly – then again, aren’t all carrier capable aircraft? 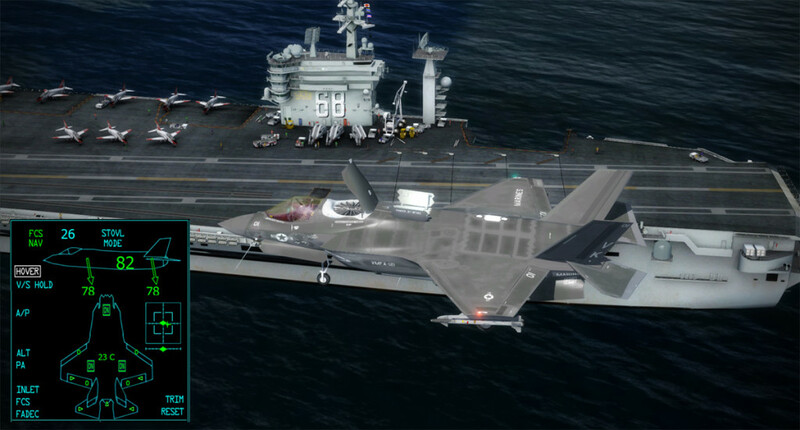 In place of the VTOL mode the C model has a tailhook and folding wings. 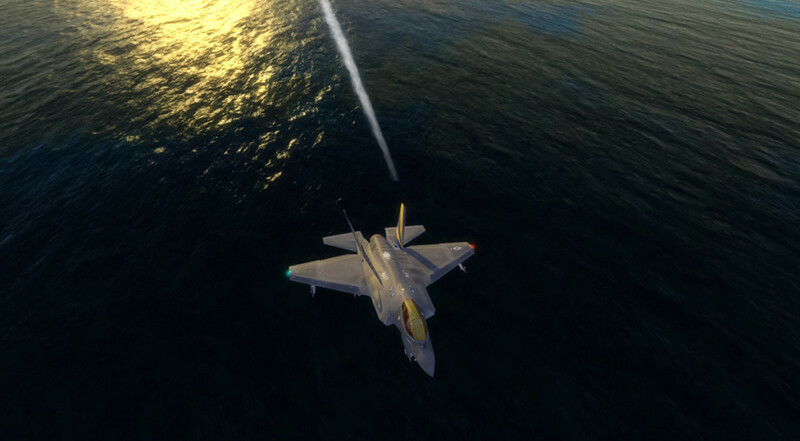 The throttle requires a good bit of jockeying around to keep a precise speed since the tendency is for the plane to sink a bit, then over-recover with throttle. Finding a sweet spot is kind of hard so you spend quite a bit of time bracketing the right setting. The plane feels great, but it might be a bit overpowered off the cat with full fuel and ordnance (I could be wrong). * Please consider commenting on this article. We’d like to know what you want to read about, what you don’t want to read about, and what interests you. Wow, that looks really impressive. Can’t believe it’s freeware too. 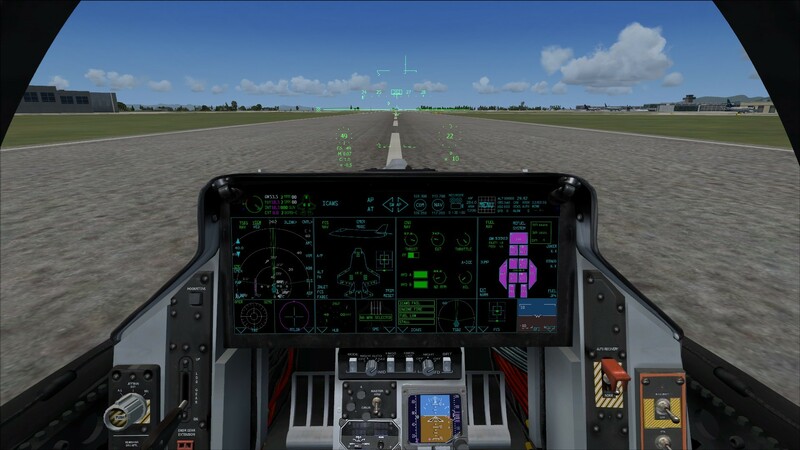 Did you try in FSX, as I think the screens and (very good) video are from P3D? Fixed small bug in the Tacpack in-flight refueling system, so that in many instances the fuel flow rate was way too low. Now it can be somewhat too fast…but will still take minutes to fully refuel the Lightning. Non-tacpack users can ignore this update. 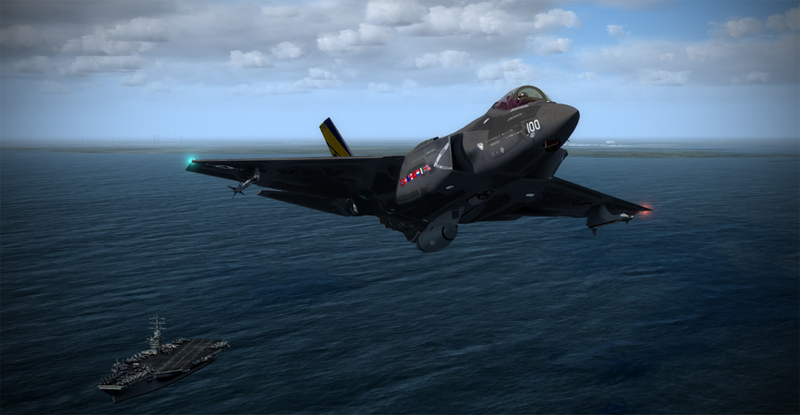 NOTE: THIS IS MEANT TO BE THE FINAL VERSION COMPATIBLE WITH FSX. There may be further upgrades in future, but they may well be Prepar3D v2.2 only. 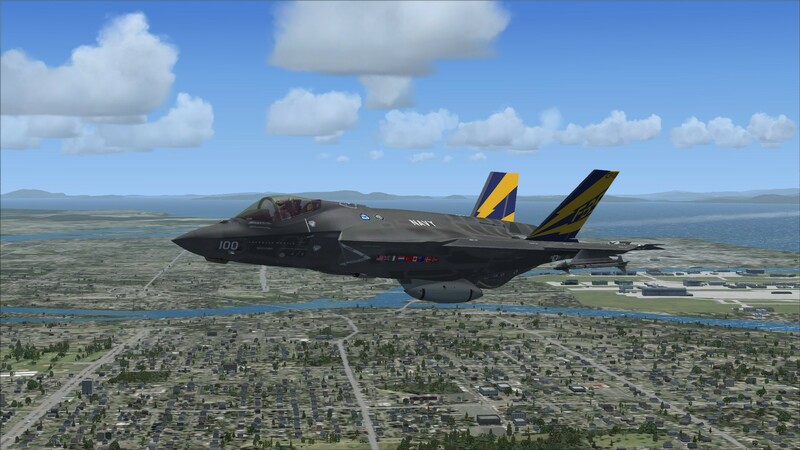 Plus the manual in F35v241.zip\SimObjects\Airplanes\F-35A\docs looks really well done too! 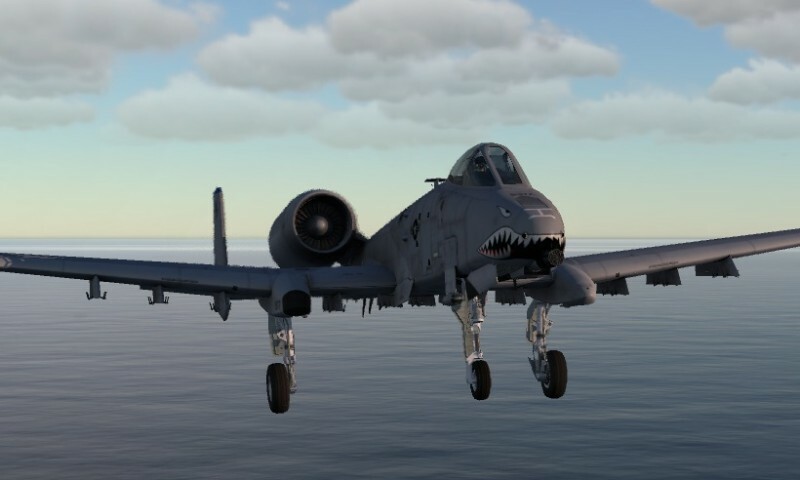 Works great in the Steam FSX edition! 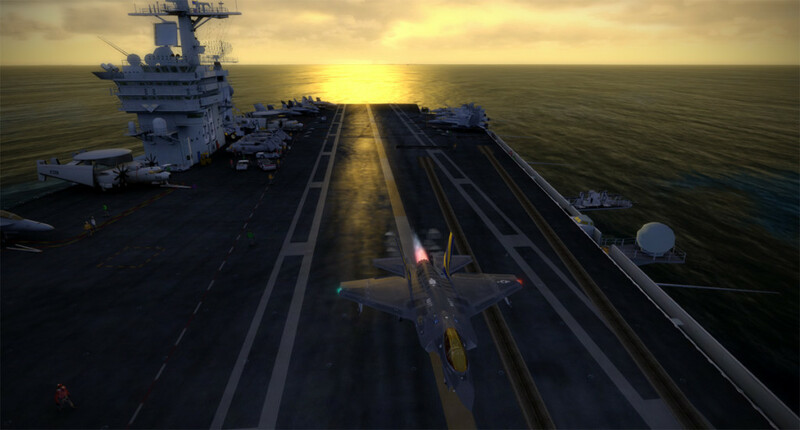 AICarriers - A .NET port of the AI Carriers utility by Lamont Clark. 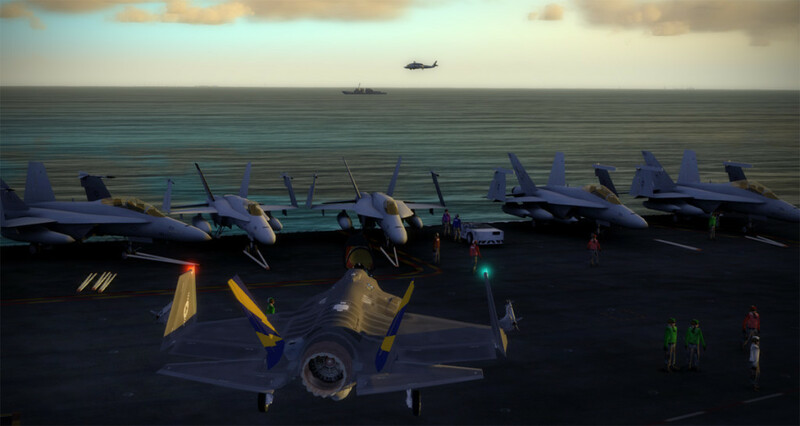 Here is the USS Nimitz & USS Eisenhower warships aircraft carrier from the US fleet. This is an add-on called AI (Artificial Intelligence) that is controlled by the computer. Nice - it’s really apparent in using the sim (however inaccurate it might be due to opsec etc) that fuel management is really important to the B variant.